Expanding into a spare bedroom created a modern, light filled bathroom for Naomi Peet and Ben Hadley in their newly renovated Oxfordshire home. A bedroom in a Victorian house has been transformed into a spacious, well equipped, luxury bathroom where the emphasis is on calm and relaxation. 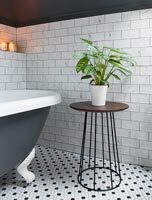 When Mr and Mrs Jarman-Alexander first saw their floor tiles months ago they vowed to create a new-look bathroom based on their unusual design. Rebecca Brough stuck with her distinctive vision and pushed the boundaries to design a bathroom packed with eclectic style and vibrant colour. When Heather and her husband Peter moved into their East London home, the only bathroom was located at the back of the kitchen. A beautiful vintage style bathroom makeover in a traditional bungalow. 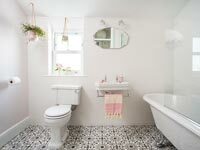 To ensure her new bathroom had masses of wow factor, Rhiannon Southwell created a totally new layout and indulged her passion for pattern, going bold with striking geometric flooring. A confident combination of geometrics, greys and generous fittings show that bold is definitely beautiful in Michelle Sames�s bathroom. Florist Juliet Henin went for bold colour and grown up glamour in her dated ensuite in her four bedroomed Victorian terrace to create period elegance and classic style. Wendy and Jeremy drew up the layout themselves and worked with recommended local builders and suppliers.